Like the majority of people in this world I am addicted to caffeine, and like most people in Seattle I have a strong opinion on the best place to get your morning coffee. But my scholarly interest in coffee began when I read Orhan Pamuk’s My Name is Red. As much as I love the Nobel Prize winning Turkish author, I noticed that he made some grievous errors in his descriptions of Ottoman coffeehouses. As I looked into the matter further, I noticed that the majority of historians have misconceptions about the Ottoman coffeehouse. In response to these misconceptions I wrote my undergraduate thesis on coffee and the establishment of the Ottoman social sphere. Since then I have traveled to Istanbul to study the history of Ottoman coffee culture. Coffee brewing originated in the Sufi orders of Yemen. In Ottoman times the Sufis were an unconventional sect of Islam and were known for their dancing and whirling in devotion to Allah. Their practice could last for many days and required the consumption of a drug that would sustain them. The idea of bonding over a cup of coffee began in these Sufi lodges. In 1555 two Syrian merchants named Hakam and Shams recognized the commercial potential of the beverage and opened the first coffeehouse in Istanbul. Within fifteen years over 600 coffeehouses operated within the confines of the Ottoman capital. The majority of our evidence of coffee and coffeehouses comes from Europeans who traveled to the Ottoman Empire in the 16th and 17th centuries. Although coffeehouses were strictly Muslim establishments, travelers were allowed inside to observe the activities that transpired within the coffeehouse and sample the brew. Europeans were unimpressed with the beverage and expressed their disgust in their diaries. In an attempt to understand why coffee was so popular, they found other applications for the drink. European physicians claimed that coffee alleviated headaches, dizziness, and sleep problems and noted that Muslim women used coffee as a form of birth control. Europeans also disproved of the allegedly bland Ottoman diet, and believed that coffee added taste where it was lacking. Since wine is haram, or forbidden, in Islam, travelers believed that coffee fulfilled alcohol’s social function. The activities within the coffeehouse are especially fascinating. Many students have read about British coffeehouses (adopted from the Ottomans) which were called penny universities. In British coffeehouses wealthy men like Voltaire gathered and discussed politics. Unlike European coffeehouses, in the Ottoman Empire every Muslim man was welcome in the coffeehouse as long as they could afford a cup of coffee. This meant that dock workers and servants of the Sultan could have the same experience drinking coffee. Perhaps they even played a game of chess together. Within the coffeehouse patrons discussed politics, art, and science, played chess and backgammon, and recited poetry. These were not professional poets, rather they were laymen who felt comfortable enough to divulge their innermost feelings to a room full of coffee-sipping strangers. Storytellers also populated the coffeehouse. Unlike minstrels or court entertainers, urban storytellers frequented the coffeehouse and told traditional Ottoman and Islamic tales with an unprecedented sense of history. 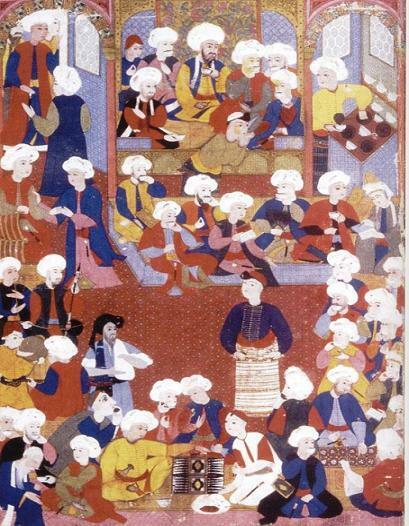 16th century Ottoman miniature of a coffeehouse. Note chess and backgammon played in the bottom, a poet in the middle, and upper class men conversing near the top. 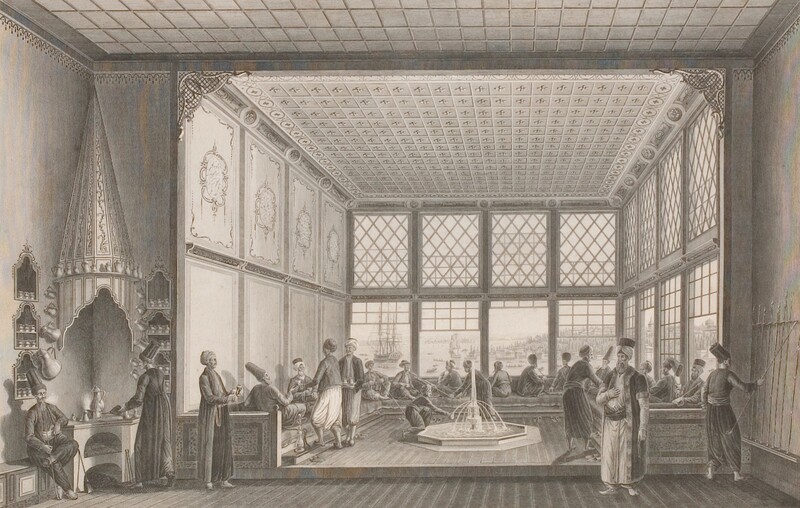 The coffeehouse remained popular within the Ottoman Empire for centuries. However, the response from authorities was varied. Sultan Suleyman established a chief coffee cook for himself and set up coffeehouses in newly conquered territories to demonstrate the civility of his rule. In contrast Sultan Murad IV feared that his subjects were gathering in an attempt to overthrow him. In response, Murad banned coffee and tobacco and claimed that he would decapitate people in the streets if he saw people drinking coffee. Murad used Islamic doctrines and medical evidence to ban coffee. He argued that coffee made men physically weak and led to sterility. Murad’s laws were ignored, however, as the Ottomans continued to drink coffee and frequent the coffeehouse. Have you ever tried Turkish coffee? Turkish coffee is unique in that it is not filtered before being added to water. Rather, the finely-ground beans are added to the cup to create a thick sediment. Turkish coffee is so bitter, strong, and hot that it must be sipped very slowly in order to avoid getting burned. The Ottomans served their coffee in 3 oz ceramic cups called China and drank it in the evenings. In fact, the Turkish word for breakfast, kahvaltı, literally means “before coffee”. 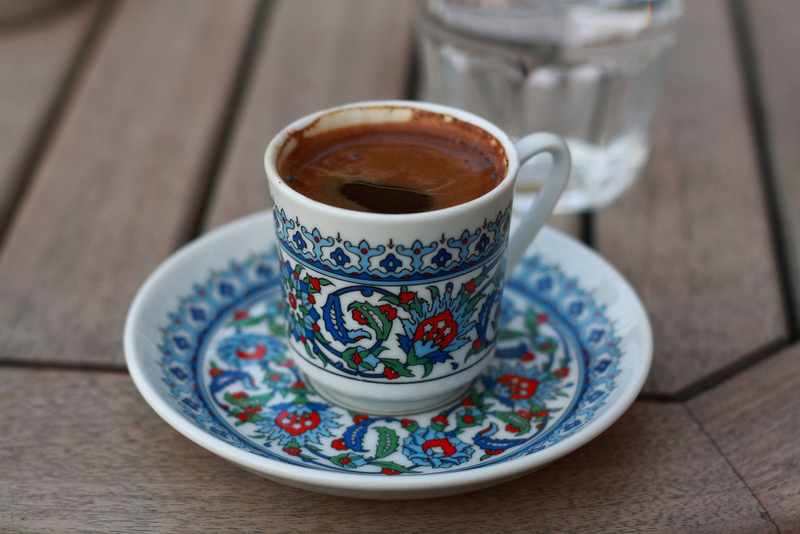 The Turks traditionally took their coffee without the addition of sugar or spices. To get the full Ottoman experience try drinking it straight and imagine yourself in a room full of poets and chess players in Ottoman Istanbul. Andrews, Walter and Mehmet Kalpakli. The Age of Beloveds. London: Duke University Press, 2005. Cizakca, Defne. “Long Nights in Coffeehouses: The Effects of Place on Ottoman Storytellers.” University of Glasgow. Yusek, Yusuf A. “On Coffeehouses in the Late Ottoman Empire.” Bogazici University. This article was published on Savor Food History, then re-published on Atdaa with author's permission.